Did you know nearly 90% of American adults suffer from foot, knee, back or leg pain at some point in their lives? This kind of pain can be debilitating, causing them to stop doing the things they love, even interfering with their ability to work! Since 1992, The Good Feet Stores have been synonymous with pain relief, and as baby boomers age, the market segment and the opportunity keep growing! People are searching for instantaneous relief from their pain without surgery so they can return to the life they loved! Millions of Good Feet customers celebrate the Good Feet products everyday and live pain free! Great growth potential: Whether you would like to operate one Good Feet Store or fifty-Good Feet offers exclusive territories to help you meet your personal goal! Great margins: Good Feet franchisees enjoy phenomenal product margins on all Good Feet products-and great relationships with Good Feet's selected vendors! 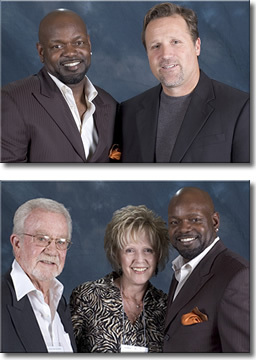 Proven media strategies and marketing materials featuring football superstar EMMITT SMITH! Modest on-going monthly royalty fees—just 2% management and 3% advertising fund—that's it!!! No medical training or certification necessary! Intensive on-site new franchisee training at the FSC in beautiful San Diego, California. Fantastic Franchise Support: Our Franchise Support Center (known as the FSC) is dedicated to the success and support of every franchisee. We assist you from A to Z—with store design and build out to training for you and your staff to opening day and beyond! The FSC is constantly working to identify new and improved profit centers for our franchisees as well as networking our franchisees together for improved communication and idea sharing. You are never alone with Good Feet behind you! Good Feet is completely unique, because we manufacture our own patented, trademarked products available only in our exclusive retail stores! Good Feet has more than 25 different product lines in over 300 sizes for both adults and children, so your clients walk out of your stores with their supports, no waiting for weeks to get relief! Most Good Feet products are backed by lifetime warranties and are manufactured in the Good Feet manufacturing plant in the USA. Combine this extensive product line with phenomenal marketing support and a strong commitment to customer service, and you'll see why millions of people depend on Good Feet arch supports everyday! The great thing about being a Good Feet franchisee is you can own and operate a single store profitably or multi store territories and regions. I started with one store and virtually no retail business experience. Over the past eight years as I gained experience and knowledge within the system I have opened 14 stores and maintained ownership in all 14. There is truly opportunity for the first time franchisee and the sophisticated investor. We had a customer say because the products changed his and his wife's lives that we are blessing people and making money at the same time. He couldn't be more right. At the end of August of this year, our sales exceeded beyond what we did the entire year of 2007. We have our busy months approaching us and can't wait. We were not running the Emmitt infomercial or the :30 spots when the snowbirds were here last year so that will have a huge impact on our business this year. Just sharing information that our business is certainly profitable I would think would be pretty convincing. Having Emmitt Smith as our spokesperson, says it all. Good Feet was founded in 1992 and has been franchising since 2003. Our corporate headquarters are located in Carlsbad, California and we have 138 units located in U.S., Canada, Kuwait and South Korea. We look forward to talking to you please ask for Randy Blue, Director of Franchise Development. Please note this opportunity is offered in the U.S., Canada and Internationally. Interested parties should have at least $50,000 liquid captial to invest. Click on Request Information for FREE info on how to open a Good Feet Worldwide franchise today! Please Note: This Good Feet Worldwide, LLC franchise opportunity and other franchise business opportunities, businesses and franchises for sale on this web site are not to be considered as an "offering", "franchise offering", suggestion or recommendation by Franchise Leader™. This advertisement depends entirely on the truthfulness of the information provided by our advertisers which includes, but is not limited to, franchisers, franchise brokers, franchise consultants and business brokers. Franchise Leader™ recommends that you consult a lawyer, financial consultant, accountant or professional advisor before buying a franchise or business opportunity or any type of business. By using this form or any part of our website, you have agreed to all terms and conditions of Franchise Leader™. Please review our Terms & Conditions for more information.